"Our heart-felt condolences to all the O'Quinns in the loss..."
"Robert and Dawn I am so sorry for your loss. I will keep..."
"Our family members send deepest sympathies to your entire..."
"Robert, Dawn, Lizette, and siblings, Although my husband..."
Frank Morat O'Quinn, a resident of Baton Rouge, passed away Saturday, February 9, 2019, at the age of 90. He was the cherished husband of Jacqueline "Jackie" Guidry O'Quinn for 67 years, and father to their eight children: Mary Werk (Ingo), Frank J. "Butch" (Beth), Michael (Anne), Patrick (Lillie), Elizabeth "Lizette" Kummrow (Jack), Robert (Dawn), Lucie Brant (Stan), and Melanie Samaha (Brent). Preceded in death by parents James J O'Quinn III and Clothilde Inez Wells O'Quinn Kaiser, brother James J O'Quinn IV, sister-in-law Geradine "Dee" Roy Guidry, brothers-in-law Leonard "Lenny" Robichaux and Bruce Sheldon, and by two infant grandchildren. He is survived by four siblings: Margaret Ann Sheldon, Ed "Boothie" (Robyn), Milton David (Theresa), and Frances Corrine Robichaux, and by brother-in-law Charles "Buddy" Guidry. "PapaO," as he was known to his grandchildren, is also survived by 22 grandchildren, nine great-grandchildren, and numerous nieces and nephews. Mr. O'Quinn was born September 24, 1928, grew up in Colfax, La., and graduated from Menard High School in Alexandria, La. He attended Louisiana State University from 1945-1949, earning a Bachelor of Science degree in Mechanical Engineering. He spent the next 20 years as an officer in the U.S. Army Corps of Engineers, serving in various posts and including duty assignments in Korea and Vietnam during times of combat operations, retiring at the rank of Lt Colonel. 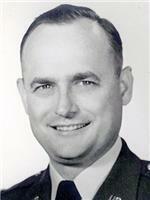 During his army years, he earned a Masters of Science degree in Civil Engineering from Oklahoma State University. After his retirement from the U.S. Army, Mr. O'Quinn and family settled in as permanent residents of Baton Rouge, where he worked 10 years and retired from South Central Bell, followed by another 10 years as an instructor in the Department of Construction Management at Louisiana State University, where he enjoyed being called "Uncle Frank" by his students. After retiring from LSU, he continued an additional 6 years as an adjunct professor in the same department. Frank and Jackie were life-long members of St Jude the Apostle Catholic Church. Mr. O'Quinn was a member of Knights of Columbus and served two years as a Grand Knight. He was also an active member of The Military Order of the World Wars and inducted into the Hall of Honor for the Cadets of the Old War Skule. Relatives and friends of the family are invited to attend the visitation at St Jude the Apostle Catholic Church, 9150 Highland Rd on Tuesday, February 12, 2019 from 9:30-11:00 a.m., and Funeral Mass following in the Sanctuary. Graveside services will be held immediately following at Greenoaks Memorial Park, 9595 Florida Blvd, in Baton Rouge. In lieu of flowers, donations may be sent to the Society of St. Vincent de Paul.